Quick, tell me, what is Popeye’s favorite food? Yes, it’s spinach. Why? We’re told it’s because it makes him strong. If we want to be a little more precise, we can say that spinach helps us because it contains non-heme iron — a type of iron found in plant-based foods. There are two types of iron found in our foods, heme and non-heme. Heme iron is found in animal based foods such as beef, turkey and fish. Non-heme iron is found in enriched ready-to-eat breakfast cereals, legumes, tofu and broccoli (and other foods too, like spinach). Our bodies are able to more easily absorb heme iron (the type from animal products) than nonheme iron (from plants). However, most of the iron we typically consume in our food is the nonheme type from plant sources. One reason that nonheme iron is not as readily absorbed may be due to certain compounds that naturally occur in some foods. Spinach, for example, has oxalic acid which appears to reduce the amount of iron absorbed. One way to help improve absorption of nonheme iron is to consume vitamin C at the same meal. For example, try sprinkling some lemon juice on your spinach to increase the absorption of the iron. There are other factors which can also affect iron absorption — to learn more about this topic, take a look the Dietary Supplement Fact Sheet: Iron from the Office of Dietary Supplements, a part of the National Institutes of health. A half cup of spinach cooked from fresh contains about 3.2 milligrams of iron, while a half cup of firm tofu has around 2 milligrams, according to the USDA National Nutrient Database. The daily recommended amount for iron is 18 milligrams/day for females age 19 to 50 and 8 milligrams per day age 51 and older. For men the daily recommended amount is 8 milligrams per day for age 19 and older. So it might take a little planning to make sure you are meeting your daily iron needs. Iron supplements are not generally recommended unless prescribed by your doctor because too much iron is toxic and can accumulate and damage your organs. If you think you need an iron supplement, contact your doctor for assistance. Why do you need iron? Iron is an important mineral that is part of the hemoglobin in our red blood cells. Hemoglobin carries oxygen throughout our bodies. Iron is also a part of many enzymes which help with the numerous biochemical reactions that keep our bodies strong and healthy. If you don’t have enough iron in your diet, many different parts of your system can be affected. Take care of yourself — make sure you are getting the right amount of iron in your diet every day. Just bought a bag full of organic lemons…and have a refrigerator full of spinach. Thanks for the insight into how the combination benefits! Great blog- keep on writing! 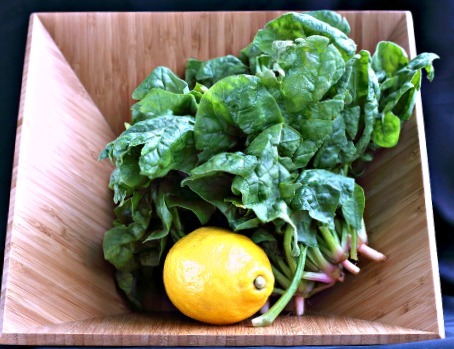 not gonna lie, I love squeezing lemon juice on most of my greens, including spinach — glad to read it’s actually helping me out! Interesting article and very informative. Great picture, too. Keep up the good work!